The default is nil for cells in plain-style tables (UITableViewStylePlain) and non-nil for section-group tables UITableViewStyleGrouped). Therefore, if you're using a plain-style table, then you'll need to alloc-init a new UIView having your desired background colour and then assign it to selectedBackgroundView. if all you wanted was a gray background when the cell is selected. Hope this helps. Don't forget to import QuartzCore. The following works for me in iOS 8. I have to set the selection style to UITableViewCellSelectionStyleDefault for custom background color to work. If any other style, the custom background color will be ignored. There seems to be a change in behaviours as previous answers needs to set style to none instead. Create a custom cell for your table cell and in the custom cell class.m put the code below, it will work fine. You need to place the desired color image in selectionBackground UIImage. We need to set the selected background view in this method. One more tip to Christian's way to show rounded corner background for grouped table. If I use cornerRadius = 10 for cell, it shows four corner's rounded selection background. It's not the same with table view's default UI. So, I think about easy way to resolve it with cornerRadius. As you can see from the below codes, check about cell's location (top, bottom, middle or topbottom) and add one more sub layers to hide top corner or bottom corner. This just shows exactly same look with default table view's selection background. I tested this code with iPad splitterview. You can change patchLayer's frame position as you needed. Please let me know if there is more easier way to achieve same result. Probably what you want to do may be achieved by selecting the right standard option. Let me know if that works for you as well. You can mess with the cornerRadius number for the effects on the corners of the selected cell. I've got a slightly different approach than everyone else that reflects the selection on touch rather than after being selected. I have a subclassed UITableViewCell. All you have to do is set the background color in the touch events, which simulates selection on touch, and then set the background color in the setSelected function. Setting the background color in the selSelected function allows for deselecting the cell. Make sure to pass the touch event to the super, otherwise the cell won't actually act as if its selected. To override UITableViewCell's setSelected also works. Here is the important parts of the code needed for a grouped table. When any of the cells in a section are selected the first row changes color. 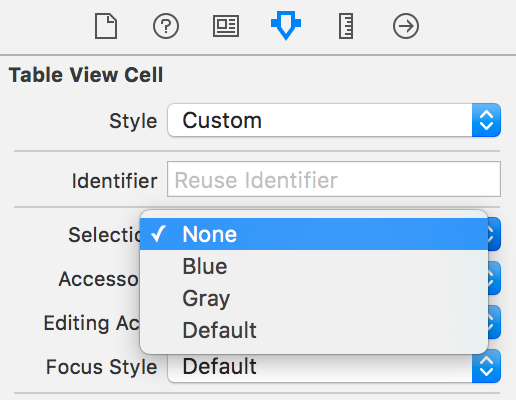 Without initially setting the cellselectionstyle to none there is an annonying double reload when the user clicks row0 where the cell changes to bgColorView then fades and reloads bgColorView again. Good Luck and let me know if there is a simpler way to do this. Then call removeCellSelectionColour() with cell instance. Not the answer you're looking for? Browse other questions tagged ios objective-c uitableview selection-color or ask your own question. How to change color of UITableViewCell when selecting?